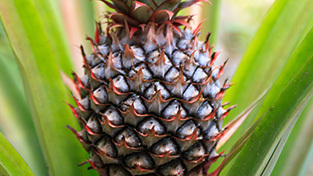 Pineapple is rich in bromelain, which has great qualities such as anticoagulants and circulation, and which consists on three enzymes: bromelain, and extranasa ananasa. Bromelain also helps to digest the protein, which helps us to have a good digestion, since a good chunk of pineapple after meals will help to better digest food and digestion is lighter, helping us to decrease stomach acid and intestinal gas. 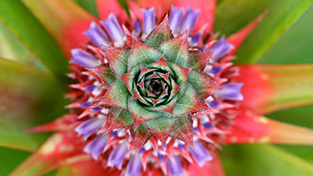 This property of the Pineapple of better digest food also helps to eliminate the bacteria that causes intestinal putrefaction, thus helping to prevent diarrhea and stomach pains. 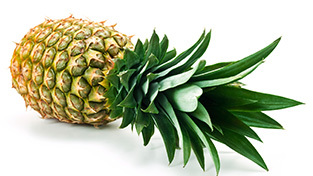 Bromelain Pineapple contained in also helps to digest fat, which makes the pineapple a source for treating obesity. Pineapple is also rich in Vitamin C, pectin and fiber. It is an excellent diuretic and contains Asparagine and Potassium, which neutralizes the sodium, caffeic acid and arginine. These (Asparagine and Potassium) help to remove water from the body, thereby avoiding the formation of edema or fluid retention. This same property is used for the treatment of Cellulite. The pineapple has anti-inflammatory properties so it is very useful for reducing pain, preventing tendinitis and inflammation of the synovial sacks (bursitis).